We've all noticed ads for businesses offering search engine submission services. Most of these companies boast that they will submit your site to "thousands of search engines", while guaranteeing an effective SERP listing. Are search engine submission services worth the money? Discuss this and other topics at WebProWorld. "(Y)ou absolutely do NOT need to submit your URLs to Yahoo at all. They will find and index all your pages for free if you just give them a crawler-friendly site and the time to do so." This also applies to Google and the other major search engines. Manual submission is not necessary because their spiders will usually find and index your automatically. Marcia, a prominent poster on the SEO forums, said at WebmasterWorld, "They (search engines) all find sites through links anyway. Some people don't even bother with submitting at all anymore." On the SEW forums, Marcia goes on to say that these submission services may violate the search engine terms of service agreement which could result in getting your site banned. WebmasterWorld poster "bufferzone" echoes this by saying, "Some SE's don't like auto tools and will penalize or ban sites where these tools are used. They are relatively easy to recognize and therefore relatively easy to handle for the SE's." "There aren't any thousands of search engines, there are only a few that actually drive any traffic. And those will find sites through following links." Meaning that if you have backlinks from other sites pointing to yours, the major search engines that drive the market will find you. Following this rationale, you wind up paying for a service that's going to "submit" your site to who knows where. Granted, there are smaller search engines and directories to which sites can be submitted, but I'm not sure if they number into the hundreds of thousands. Prices for these services range from $19.95 to $179.99. From reading the majority of the responses concerning this subject, it seems like this money could be better spent. 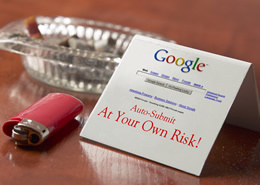 If you have ANY backlinks to your site, the major search engines will usually find you. Submission of any kind isn't necessary. To be fair, people who have used these services seem to be pleased with their investments. It's not that these companies don't do what they say (although, 800,000 is a little extreme), rather, it's whether or not these services are even needed. When reading what the SEO experts have to say, you are left with one conclusion: These services are not required in order for search engines to find your site. Marcia concludes these thoughts rather well by saying, "Save your money and put whatever resources you have into learning more about site promotion so you'll be operating on a solid base. There's a wealth of information available for anyone who's willing to learn, some at modest cost and some at no cost." Thanks to rustybrick at SearchEngineRoundtable for pointing this out. Chris Richardson is a search engine writer for WebProNews, part of the ientry.com network which has over 60 different styles of coverage, ranging from IT to ebiz.